Today, we are seeing an explosion in virtual world platforms. We’ve got various — and incompatible — open source projects, including OpenSim, Open Wonderland, Open Cobalt, Sirikata, and Vastpark. We’ve got stand-alone proprietary software that runs behind corporate firewalls, and requires dedicated viewer software, including ProtoSphere, Teleplace, and SAIC’s Olive. We’ve got proprietary browser-based virtual meeting platforms, including ReactionGrid’s Jibe, Avaya’s Web.alive, VenueGen, Assemblive, Altadyn’s 3DXplorer, and 3DVia Scenes. Some of these platforms will probably die off or slowly fade away — but that won’t help businesses faced with too many choices, as even more new platforms will probably appear in their stead. There is some hope, however. As technology develops, we will see some convergence between these platforms. Eventually, they will all be interoperable. You will be able to use any of several viewers to access worlds run on different platforms — the same way that you can now use Explorer, Firefox or Chrome to access Websites running on Apache, Microsoft’s Web Server, or other Website server software. Three main issues will have to be resolved for this to happen. Today, there are two main ways to organize the geography of a virtual world. You’ve got the grid-based, checkerboard approach used in Second Life and in OpenSim and its derivatives. The advantage of the grid is that users can walk from one grid square — region — to another. They feel as though there is a big, wide world there, which helps create a sense of virtual place and leads to increased immersion and engagement. Grids are also easier to navigate — someone can walk in one direction, turn around, and walk back the way they came. This allows people to use their natural orientation skills to find their way around. Finally, grids are inherently scalable. A different server can run each of these regions. As the grid grows, new servers can be added to handle the additional land area. The other approach is the room metaphor. Each room is its own self-sufficient world. The only way to travel to another room is by teleporting — by click on a teleport button, or using a teleportation portal. The advantage of this approach is that each room can be as big as you want — or as big as its server can handle. A room can be so big that the ceiling is the sky, the walls are far off in the distance and painted to look like landscape, and there’s an entire virtual city inside the room. Another advantage is that a room can be connected to any other room without regard for spacial restrictions. For example, you can have a central lobby with several doors opening up to giant auditoriums — even though those auditoriums wouldn’t be able to fit next to each other geometrically. There’s a downside to this, however, since people can get very confused about where they are. In addition, if the inside of a building is bigger than the outside, it creates a feeling of unreality and can reduce immersiveness. Some room-based virtual world platforms are allowing their customers to create a grid-like environment by having an entire exterior wall of a room be a transparent portal to another room. Meanwhile, in OpenSim, individual regions can be combined into megaregions, without the hiccups of border crossings. Eventually, rooms and regions will become indistinguishable, as room borders evolve into border crossings, and OpenSim regions become even more variable in size. Today, the bulk of Second Life and OpenSim content is in the form of prim-based objects — made from basic shapes like cubes, spheres, and cylinders. But the objects in all other virtual world platforms are based on meshes, allowing objects to be much more complex and realistic. The advantage of prims is that they are easy to work with. The disadvantage is that its hard to make realistic-looking animals, trees, or other objects that don’t lend themselves easily to being built out of cubes and spheres. The advantage of meshes is that they add realism to the environment. The disadvantage is that they typically require that creators know how to use 3D modeling software, and import their creations into the virtual environment. Recently, however, both Second Life and OpenSim added mesh support. At some future point, we might see all objects in these environments, whether built out of prims, scuplties or meshes, to be sent to viewers as if they were mesh objects. After all, a cube is nothing more than a mesh with just eight vertices. For in-world editing of objects, native Second Life and OpenSim viewers may still continue to work with prim-based objects — or we might see the emergence of easy ways to edit full mesh objects in-world. Meanwhile, in the mesh-based universe, some virtual world platforms are beginning to offer some in-world editing tools to their users. In Teleplace, for example, users can resize, rotate, and group mesh objects. 3DXplorer offers even more in-world editing functionality. Today, avatars in OpenSim and Second Life have social identities — they belong to groups, and have friends. And they also have inventories of stuff that they own. By comparison, avatars in the other platforms do not have inventories and have few, if any, social tools at their disposal. In the future, we will probably see the emergence of third-party repositories for avatar identities and inventories. 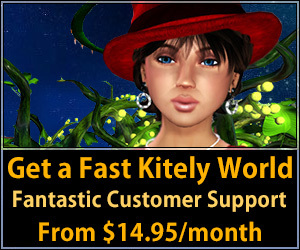 Kitely, a cloud-based OpenSim hosting provider, took one small step in that direction this week by using Facebook logins to create avatars. Meanwhile, some of the other platforms allow the use of avatars from third party systems such as Evolver. Eventually, we’ll see a full severing of the link between avatar identities and virtual world hosting companies. For example, today, you typically get your Internet connection from one provider — your cable or telephone company, for example. You get your email from someone else — Gmail, Hotmail, or your company or school. Your Websites are hosted elsewhere yet again — with GoDaddy, or Dreamhost, or some other hosting provider. And your social connections are on Facebook or LinkedIn or Twitter. But there used to be a time where you got everything in one place — AOL was your ISP, and your email provider, and your social network, and the place where companies put up their content pages. On top of that, AOL had its own search engine, news portal, games, its own viewer, and its own proprietary server software. 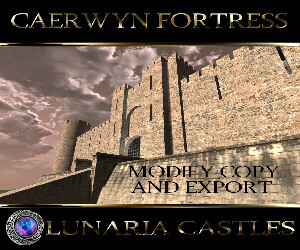 Today, vendors like Second Life or InWorldz also try to be all things at once. But, in practice, no one vendor can be good at everything at once. By pulling the different features of a virtual world apart, virtual platforms will be able to evolve faster, and people will be able to pick and choose the particular systems that they want to use. They’ll be able to choose from a variety of hosting providers — running on different platforms — for their virtual land. Use their favorite avatar generation tool to create their avatar. Use their favorite social network to manage connections to their friends. Pick the best search engine. And choose from several different inventory storage companies — virtual closets — based on which offers the best management tools and the most storage space.